Hi, my name is Brieanne and I’m the groomer here. I started working with animals back in 2000 (with Dr. Horn). I started as a bather/kennel attendant and worked my way up to assistant. I attended the RVT program at Mount San Antonio College. When I decided to become a groomer, I took my education seriously to be the best. I graduated from The Art of Fur Academy in San Diego, CA back in 2016. I was taught by celebrity groomer Kathleen Sepulveda. I also did an internship under Dianne Russel at the Taj Mapaw Spaw. I obtained my bather/ brusher certification in a class taught by Teri DiMarino. I am currently learning Asian Fusion Style grooming which is currently (as of 2018) very popular. I am an advocate of hand-stripping instead of shaving a pet which is much better for their coats. I take expanding my knowledge seriously and in 2019 so far I have taken classes in hand-stripping, Asian Fusion, Mindful Grooming, handling of difficult dogs, health and ergonomics, specialization in skin and hair, and easy grooming for cats. 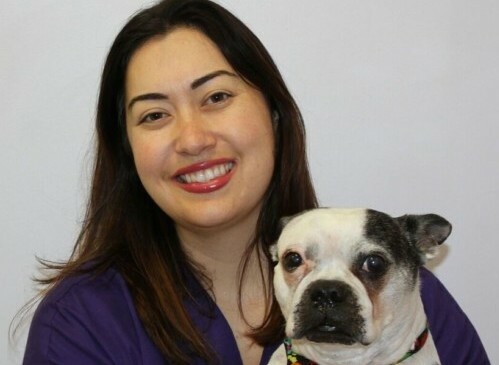 I am passionate about the health and well-being of pets in my care.